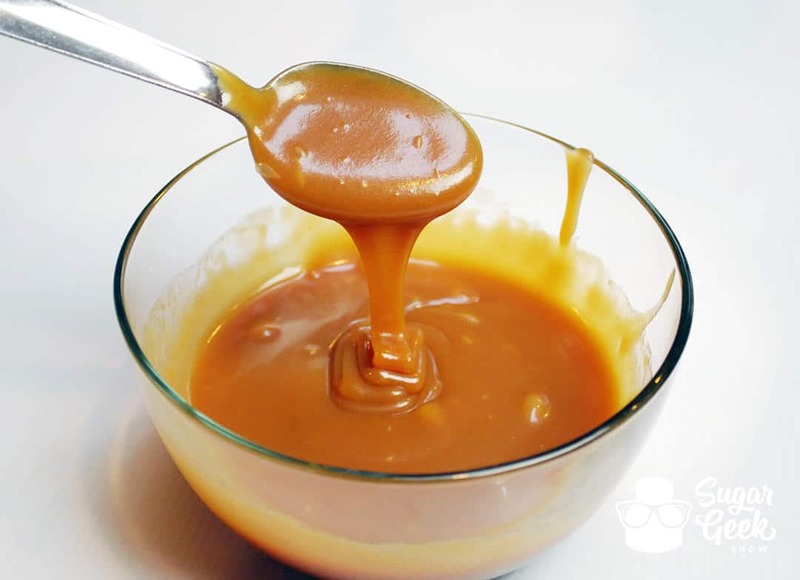 Caramel sauce that is super creamy and easy to make at home using only four ingredients! Caramel sauce is one of those things that everyone should make at home. The taste is un-matched by any store-bought version and is really simple to make! It only takes a few minutes and can be mixed into buttercream, used as a filling, over ice-cream, even in drinks! It lasts pretty much forever in the fridge and makes an excellent gift or favor. How do you make caramel sauce? Remove the pan from heat and add in your butter in small pieces. It will bubble! Use caution. Whisk to combine. Add in your cream and your salt. A few tips for success. Get all your ingredients ready before you start so you can move to the next step right when you need to. The sugar will be too pale one minute and too dark the next so keep your eyes on it! Don’t be tempted to add your ingredients too soon. You want a nice dark color but not burned. A darker color means richer flavor. A candy thermometer is your friend. I always have a batch of salted caramel in my fridge ready to go. It’s a decadent flavor that is well-loved by pretty much everyone and a little bit goes a long way. 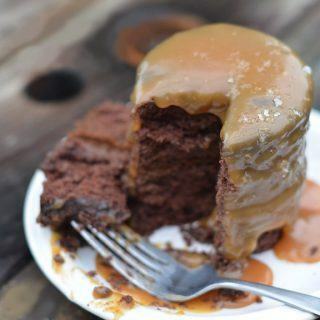 Can you use caramel sauce as a cake filling? Tip: If you want your caramel to be thicker, add more butter. 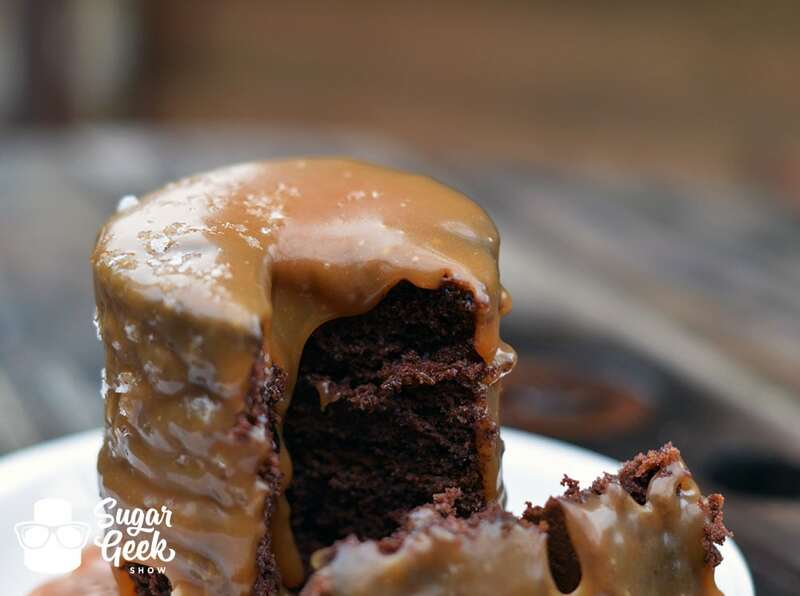 Delicious, creamy and rich salted caramel. Great for adding to buttercream or using as a filling for cake decorating. Drizzle over the top of your cake for added decadence. Remove from heat and whisk in butter then carefully mix in cream. Add in some sea salt and let set at room temperature overnight. Store leftover caramel in the refrigerator. Store in refrigerator covered for up to a month. I’m not sure why anyone had problems with the recipe. This recipe turned out exactly the way yours came out in your video. I also had my heat on medium high heat and never had an issue. I absolutely love this recipe and I’m in love with caramel sauce. Thank you again for all of your amazing recipes, tutorials and all the help you give us all the the time Lizzo. You rock my friend. Great recipe! I didn’t watch the video and missed the part about putting the lid on the pan for the first 5 minutes. I don’t know if that will make a difference but so far so good! One reason people may have had issues with sugar not desolving is from using utensils or pans that may have oil or grease on them. Make sure that all utensils and pans are oil free to start the carmilization process.